After many requests (OK, one request made repeatedly by one person - what a nudge!) 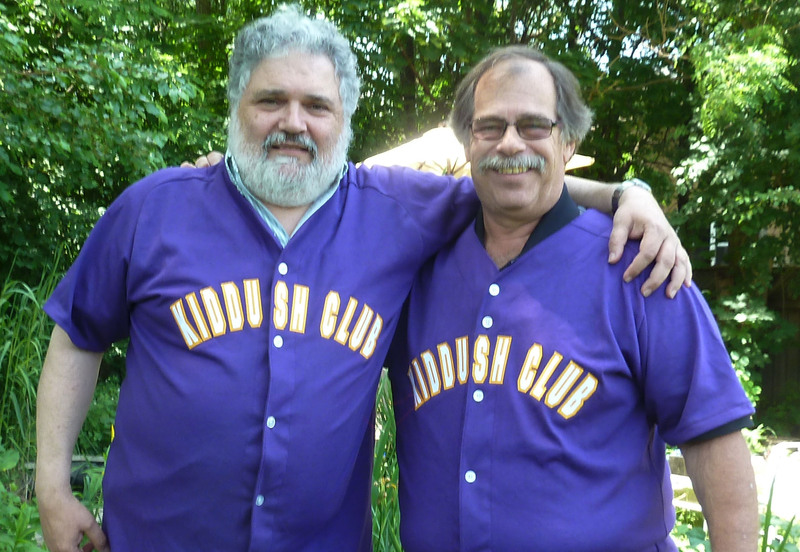 the International Kiddush Club is pleased to present the IKC Shirt - baseball style. The shirts are the same high quality product as our famed hockey shirts, but will be an all purple short sleeve poly-cotton with a "twill" front and your personal number on the back - no more anonymous #5 for everyone! Since our goal is to raise money for the IKC Tefillin Fund, and we have rachmanous on our members, there will be a new dual pricing structure for all shirts. Your first shirt, hockey or baseball will cost you $200 which includes shipping. Your second and every subsequent shirt, again, either hockey or baseball or whatever crazy idea we get next week, will be only $138 which includes shipping. The shirt is being modeled by one of the original members of the IKC (he's on the left), at an exotic international location, as well as another resident of that exotic location (Toronto). If you want your shirt for Convention 2017 we MUST receive your order NO LATER THAN July 1st, 2017! If you have an IKC Number or ID, enter it here. If not, specify what you'd like. (Subject to previous sale or committment).